By David Rodnitzky on 01/04/2011 in "Analytics Blogs"
Trying to restart my regular blogging this year. Here goes . . . I have two comments on this banner. First, what’s up with the random use of URL structure. 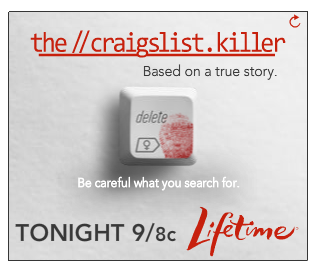 “//craigslist.killer” – so is there a domain name called killer.com and someone decided to create a sub-domain specifically for craigslist killers? And the sub-head says “be careful what you search for.” I’ve never really thought of Craigslist as a search engine – it’s more of a directory. Other than that, I love the bloody fingerprint on the delete button – nice work! I don’t blame AdWords for this – I blame the advertiser, or the advertiser’s agency. I could see trying to match content around “suicide” but the word “clean up” has 10,000 meanings other than suicide clean up. I did click on the ad, out of morbid curiosity, and the company is hiring new team members, if anyone out there is interested. The craigslist killer ad reminds me of the first days of the web when people had no conception of what a URL was or how it was formed and you got jokes like: “Have you heard of OJ SImpson’s new website? The address is Slash Backslash Return Escape.” The joke only makes sense if you assume that a URL is a basically random mix of any characters, which is what it seemed like to people at the time. I guess we haven’t come that far since then. If that is what they intended, Ben, then they are being way too nerdy for even me!